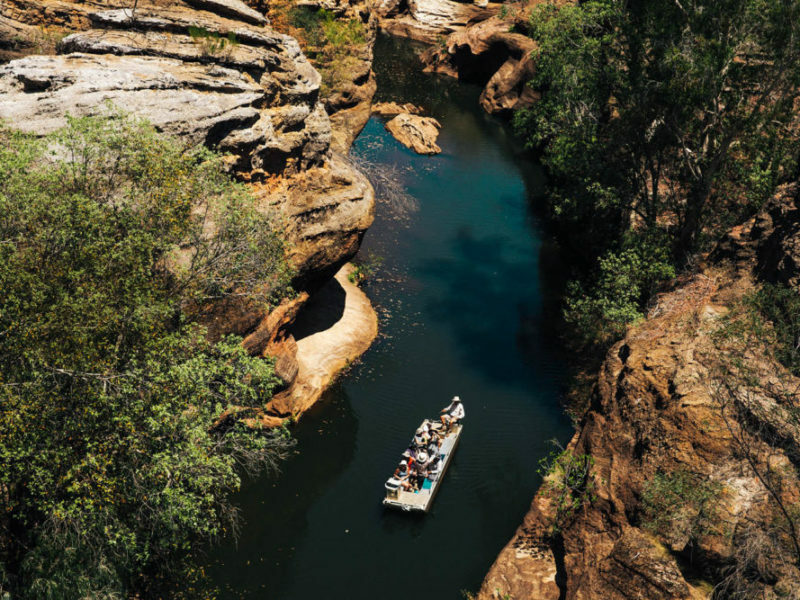 Weaving through the stunning rock formations of Cobbold Gorge by boat (photo: Brook James). Deep in the Queensland outback, David Levell discovers the stunning beauty of Cobbold Gorge, a chasm carved into the landscape that managed to remain undiscovered for millennia. Gliding effortlessly through Cobbold Gorge in Queensland’s Gulf Savannah country, the question soon becomes, which way to look? Down into the still crystalline waters? Ahead to the narrow rocky rift we’re drifting towards? Sideways at the crazy curl of ochre-banded cliff? Or above, where the rock walls either side of us rise 30 metres to frame the sky? Well, no worries; you can do it all. The silence is timeless, and there’s time enough to take in the natural beauty in every direction, inexhaustible as it is. Queensland is justly celebrated for its coastal treasures – beaches, coral reefs, rainforests – but its enormous inland has much to offer. The wide open spaces of northern Queensland’s Gulf Savannah is outback par excellence: red earth, roos galore, wedge-tailed eagles, red-tailed black cockatoos and towering termite mounds dotting the bush everywhere. Among its lesser known jewels are its amazing and unique gorges. Sprawling 1284 square kilometres, remote Robin Hood Station isn’t the only Gulf cattle property bigger than some small nations (it’s four times the size of Malta). But it’s the only one with Cobbold Gorge, the very latest thing in gorges, unknown to everyone but its Indigenous inhabitants until the 1990s and only 10,000 years old – by far Queensland’s youngest. “For those on the left, we call that Duck Rock,” our guide, Graham, sings out from the back of the small flat-bottomed boat. Drifting quietly along the half-kilometre gorge, our boat tour is approaching the narrowest point – just two metres across – and half our boatload ducks to avoid a looming rocky overhang. Some of the locals hit the road (photo: Brook James). In the heat of the day, sunlight bouncing off the water dances on the cliff walls in wavy shimmers. Silvery spiderwebs – the spider species is yet to be determined, Graham tells us – garland almost every crevice. Butterflies and dragonflies flit over the water; an azure kingfisher is poised on a branch. At the terminus, where the gorge narrows to nothing, a large snake lies half-concealed in matching waterside shrubbery. “I’ll just cut the engine so you can see how quiet it is,” Graham says. The engine was almost silent anyway, but our chatter evaporates and the still, trancelike magic of this hidden wild place envelopes us all. The quiet beauty of Cobbold Gorge (photo: Brook James). Pronounced ‘co-bold’ (not ‘cobbled’), the spring-fed (thus never dry) gorge is named after its tributary, Cobbold Creek, which commemorates pioneering Gulf pastoralist Frank Cobbold (1853-1935), who held several large cattle stations in the region. Exactly how it came to be is still a mystery, but there are two theories. One is that a split in the sandstone gradually weathered its way to meet and divert Cobbold Creek. The other says seismic uplift made the creek’s previous watercourse uphill, forcing the flow into a nearby crack to begin the process of gorge formation by water-borne erosion. Either way, the narrowness of the gorge signposts its extreme youth – 10,000 years makes it a toddler, geologically speaking. The water, slowly carving an ever wider channel through the rock, has barely begun its work. Eventually – in the far distant future, so don’t worry – the cliff sides, undercut at the high water mark, will collapse and push the process further along. At the waterhole where the gorge begins, graffiti on its sandstone cliff-wall backdrop – ‘J. E. CLARK 1900’ – shows that Robin Hood’s first owners, the Clark family, came here around the time they took up the property. Giant slabs of stone threaded with greenery puncture the surrounding landscape (photo: Brook James). But the gorge hidden beyond the curl of surrounding cliffs kept its secrets for close to another century. Cattlemen have little time for mucking about with boats and this spot, in the far south-west corner of the vast station, was never much visited (although it was surely known to the local Indigenous Ewamian people). The Clarks occasionally returned to water cattle, but rarely this far up the creek. Cob Terry did much the same after he bought Robin Hood in 1964. Eventually, in 1992, Cob’s son Simon decided to find out where the far end of the obscure waterhole led to. Hauling a tinny through the bush, he and a couple of mates became the first people – as far as anyone knows – to go boating into the unsuspected gorge. Simon was enthralled by their discovery. By 1994 he was taking small groups to see the geological marvel in his very big backyard. The tourism venture bloomed rapidly, from 200 visitors in the first year to 10,000 annually now, staying at Cobbold Village, which the Terry family built to cater for their visitors, three kilometres from the gorge across the Robertson River. In 2009, 47.2 square kilometres around the gorge was declared Cobbold Gorge Nature Refuge, protecting a unique landscape along with its fauna and flora, including the rare Gilbert River ghost gum. Paddle-boarding is the most recent innovation. But most visitors still experience the gorge much like Simon did that first time, on a small watercraft. Many will see freshwater crocodiles – about 18 ‘freshies’ currently call the gorge home, and are often seen resting on its rocky banks. The best way to get a sense of the scale of the region is to take a flight over it all (photo: Brook James). Tours also include a bushwalk to the top of the escarpment overlooking the gorge. En route Graham tells us stories of this land, occasionally pointing out plants such as the ‘soap tree’ acacia (its green seeds lather up nicely) and the poisonous red-berried gidgee gidgee. At the top, an extensive rocky plateau baking in the sun, we peer down into the twisting chasm below. For an even fuller picture, a helicopter ride presents rugged Robin Hood in all its primal outback glory. Taking off from Cobbold Village, we swoop over rolling hills lightly forested with trees of dark bark and brilliant green foliage. Countless termite mounds cast long shadows in the afternoon sun. But this is just the spectacular curtain-raiser. The bone-dry Robertson River channel appears as a broad sandy strip, endlessly bisecting scrub. Flying along and then across it suddenly puts us above what they call Sandstone Country – 80 square kilometres of rocky highland encompassing the gorge. From the air, this landscape reveals itself as a broken table-top. Massive, roughly flat sandstone slabs look like grey fingers, separated by thin chasms bursting with bright green treetops. And finally, Cobbold Gorge itself – a thin black cleft snaking through the sandstone. From this perspective you can see the fissure that swallowed us itself swallowed, now just one seam in the Sandstone Country fabric. Hovering just above where we hiked only this morning, this already feels like a reunion – or perhaps the discovery of a new and fascinating angle to a valued friend. Cobbold Gorge Village is 43 kilometres from Forsayth, and 420 kilometres from Cairns via the Savannah Way drive to Georgetown. Cobbold Gorge Village is the only on-site accommodation (en suite cabins and campsites). the Goldfields Hotel in Forsayth, also a Terry family property, is another option and gorge tours pick up there. Hearty outback tucker can be had at the Village or Goldfields Hotel. Cobbold Village/Gorge is open 1 April to 31 October. Overlooking the dam, the infinity pool has a swim-up bar, rarely seen this far outback. The gorge is only accessible via guided tour from Cobbold Village. Half-days include flat-bottom boat and bushwalking; full days go further afield and add agate fossicking. Paddleboarding and scenic helicopter flights can also be booked separately. Rarely look on newsagents shelves. Must buy a copy tmrw tas we love travelling in Australia. Thanks Australian. Traveller.